Walt Disney World Swan and Dolphin Hotel seen from the lake. Double room in the Swan wing of Swan and Dolphin Resort. Dolphin Kids Club in the Dolphin wing of Swan and Dolphin Resort. 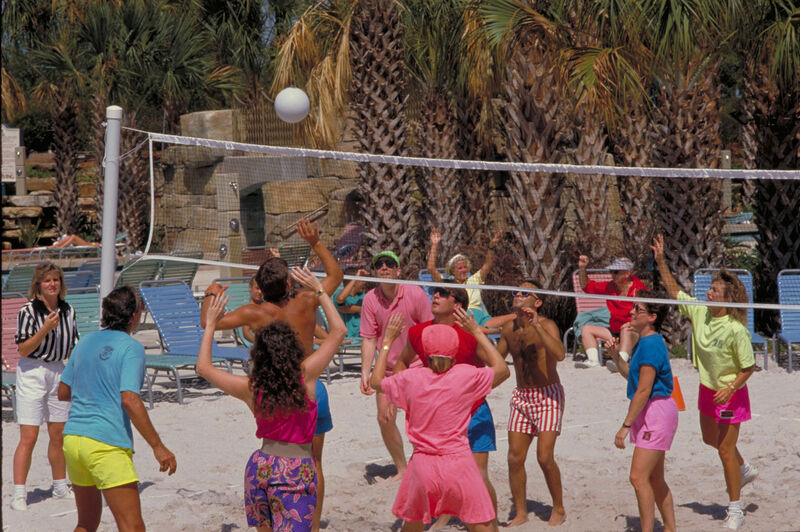 Hot poolside Volleyball competition for guests at Swan and Dolphin. 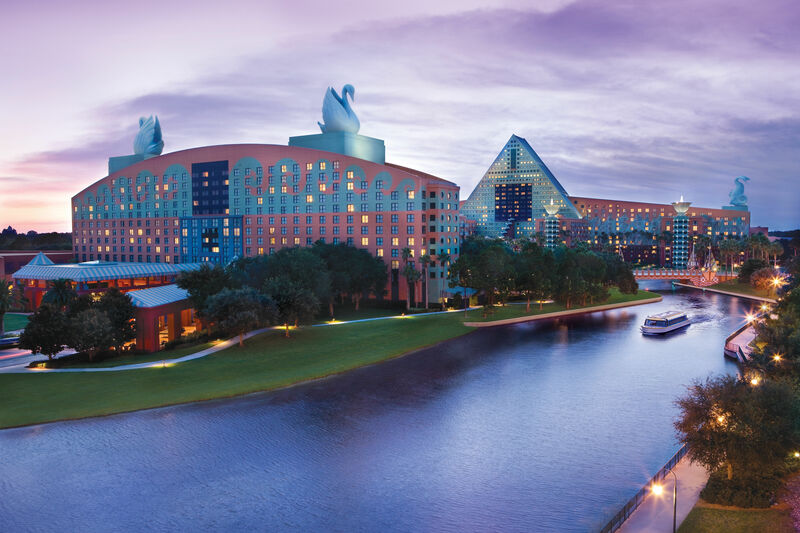 The Walt Disney World Swan and Dolphin Hotel, actually two wings of a large convention center in the heart of Orlando’s Disney World, is the perfect destination for the family who wants to do Disney with the perks of an on-site hotel but prefers time off from the constant theming. As Starwood properties, they have enviable service and great business facilities combined with a wide array of activities and programs available to the entire family. From the moment you spot the 47-foot-tall rooftop swans and two, 56-foot dolphins, you know this place is different. The soaring lobbies, turquoise and coral Floridian colors, and imaginative outdoor landscaping were designed by architect Michael Graves. Don’t miss his signature nine-story fountain outside the Dolphin which tumbles into an enormous clamshell — its waterflow is regulated so it doesn’t spray passersby on windy days. But that’s only the beginning of what makes this twin resort such fun for families. For example, if you have a smarty-pants with you who can show a report card with all A’s at check-in, he or she will receive a Straight A Club cap along with free ice cream at the hotel’s ice cream parlor! Don’t you love it? For Starwood fans, both hotels earn Starwood Preferred Guest benefits with the Swan considered to be like a Westin (double queen beds in the room) and the Dolphin like their Sheraton brand (double double beds in standard rooms). Of the nearly 2,200 rooms in both wings, all colorful, most accommodate four adults, or two adults and three children, with cots, cribs and adjoining rooms are available. Families will appreciate the Personal Pantry program, in which guests can fill out a snack shopping list and the hotel will stock your in-room fridge for you. Traveling with girlfriends, we actually stayed in an enormous two-bedroom, three bathroom suite whose ample bedding and pullout sofas could accommodate about 10, though there was plenty of room for rollaways too. The hotels have 167 suites ranging from one to two-bedroom and many adjoin to double rooms. If you prefer to book a few connecting rooms, a hotel spokesperson says you can call to make this request ahead of arrival. The Starwood agents can check to see what room types are available, and provide room prices for each room when making the reservation. Once they’ve booked it, the connecting rooms are guaranteed — very unusual, even for family-friendly hotels. Guests can also take advantage of a coin launderette. When booking, keep in mind that this place is really big. Even walks around the resort pool, or between the towers, take time and energy so choose your wing carefully. Family activities abound. Right on property are two swan boats, a fun white sand beach and playground, boat rentals, four lit tennis courts with rental gear available, two fitness centers, jogging paths and a games arcade. We are delighted that the five swimming pools (including a grotto pool with a water slide and waterfalls) have lifeguards in attendance. Camp Dolphin is open to children ages 4-12 for a cost of $10/HR per child. The counselor-led camp opens each evening from 5:30pm-midnight and includes dinner at a hotel restaurant, a game room, arts n’ crafts and movies. For parents with children 6 weeks to 12-years old who need private child care, the hotel supplies a list of babysitting services including the preferred Kid’s Nite Out; for reservations call 800/696-8105 or 407/828-0920. Nearby, there’s the cute, 36-hole Fantasia Gardens Miniature Golf Course and a special winter-themed mini golf course by Blizzard Beach. With a hotel this size that caters to business and leisure travelers, you can imagine how varied the 17 food and beverage outlets are. For your celebratory reunion dinner, choose between steak and lobster (or have both) at Shula’s Steakhouse and Il Mulino, the classic Italian eatery of Greenwich Village fame. For a fun night out with hipsters, book bluezoo, a Todd English restaurant whose sleek neon glow and contemporary American seafood will impress those hard-to-please teens. There’s also Kimonos for sushi. In the Swan, the Garden Grove Café revolves around a huge tree (perhaps The Lion King’s tree of life?) and, in the evening, becomes a fun choice for families because Disney characters Chip and Dale, Pluto and Goofy are there, too. In a cafeteria style buffet, you can order a variety of freshly prepared foods or pause at their healthy section. True to Starwood’s promise to present nutritious food options for all ages, you can have smoothies and cereal treats made with a selection of nuts, seeds and berries with healthful properties (don’t worry, they have a guide to which seed does what for you.) At the weekend breakfast, the fuzzy Disney mealmates turn up for autograph signing and photos, so it’s like packing a Character Breakfast ($24.99 for adults and $15.99 ages 3-9) into your itinerary without having to travel for it. We imagine there are plenty of families who would enjoy a stay at this huge resort even if they weren’t going to Disney World. But if you are, here are the perks the hotels enjoy that line up with what other on-site Disney hotels (some much more expensive) offer. Location is a huge plus: the hotels are within walking distance of EPCOT and the Boardwalk Resort, a fun place for nighttime snacks, people watching and Disney entertainment. There’s free, running shuttle bus and water taxis to both areas, and to Disney’s Hollywood Studios as well. However, these boats announce their arrival by honking constantly throughout the day until about 11pm, so make sure to request a room or suite away from the docks, especially if you are a family that enjoys a catnap during the day! The new MagicBands and MyMagic+ programs apply to all Swan and Dolphin guests as well. This means that guests who purchase WDW tickets in advance can order their complimentary “smart” bands and have their tickets and preferred itinerary information loaded onto them. Hotel guests can then use the MyMagic+ software to request FastPass+ tickets for timed entry to their favorite rides, and book them up to 60 days prior to arrival. Most important for guests with toddlers are extra “Magic Hours” granting one hour early admission to one of the parks each day. Teens will appreciate the two hours’ later opening, all available when you show your park tickets and keycard. Your shoppers will appreciate that in-park purchases from select Disney shops throughout DisneyWorld Resort can be delivered at no cost to the Disney shop at either the Swan or the Dolphin. We love that parents and grandparents are able to take advantage of the many fine restaurants on property. 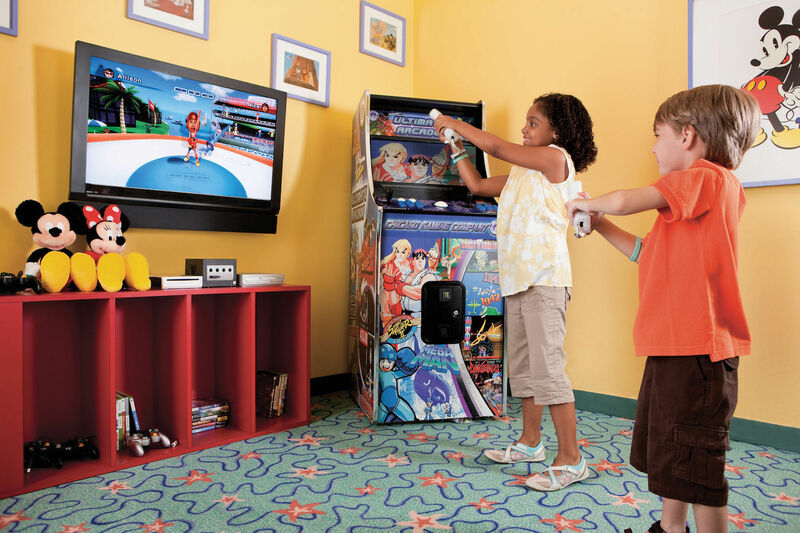 Starwood guests get two hours of complimentary child care at Camp Dolphin while dining at any of their best outlets. Reservations are recommended for this service, and just let your counselor know where you’ll be eating. In another great parent-pleasing move, the resort is offering the SPG Kids Pass. For a flat daily rate of $25, children 12 and under whose parents are Starwood Preferred Guest members (membership is free) can eat whatever they want in a variety of dining options, including children’s menus, buffets and beverages at the poolside Cabana Bar & Beach Club, The Fountain, Picabu buffet, and Fresh Mediterranean Market. To book or get more information, visit Walt Disney World Swan and Dolphin or call 800/227-1500; special offers are available throughout the year.